Xiaomi may not be the first device maker to launch a device with the Qualcomm Snapdragon 845 (that crown goes to Samsung with the Galaxy S9), but they were certainly the first to announce a device with the chipset: the Mi 7. For whatever reason, the company pushed back the release date of the Mi 7 and is instead poised to announce the Xiaomi Mi Mix 2S in its stead. Although the device has a launch date, the only information that has been officially confirmed is the fact that its sports the Snapdragon 845. Through firmware files XDA-Developers has exclusively obtained, we earlier reported on several key pieces of information about the device, and today we return with new tidbits of information. Last month, we confirmed a few pieces of information about the device. It will have a 3,400 mAh battery, 18:9 2160×1080 display, Android 8.0 Oreo, dual SIM support, and an IR blaster. The firmware that we obtained at the time was fairly close to final, but the device was still using its code-name “polaris” throughout the firmware. This time around, though, we have obtained firmware much closer to the software found on the final device launch, so we can confirm several new pieces of information. This is possible thanks to firmware files obtained by @FunkyHuawei, the man behind the FunkyHuawei.club service, which allows users to update, unbrick, or rebrand Huawei and Honor phones for a fee. He has begun offering links to OTA update files for some Xiaomi devices, and has shared the Mi Mix 2S firmware files exclusively with XDA-Developers. First of all, if there was any doubt that the Mi Mix 2S would offer dual cameras or “AI features”, let this image put those doubts to rest. The above is the phone’s camera watermark (I’ve disabled the transparency to make it easier to see), which proudly shows off the fact that not only will the device have dual cameras, but it will have an “AI Dual Camera.” Whatever that’s supposed to mean. Anyways, the fact that the phone will offer dual cameras and especially “AI features” has never really been in doubt given the many teasers that Xiaomi has been posting online. What has been in doubt is the phone’s design. 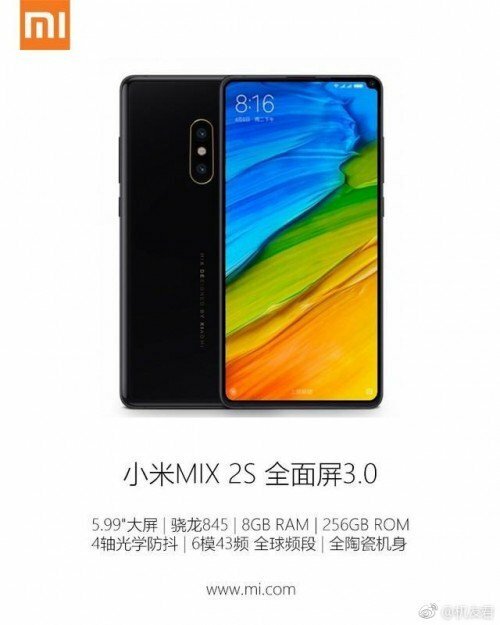 Reproduced below is the most widely circulated alleged render of the Mi Mix 2S. What is most striking about this render is the notch in the top right corner of the display that appears to house the front-facing camera: a design that eschews the recent notch trend from smartphones announced during Mobile World Congress. At the time of our previous report, we did not have any evidence one way or another to discount the validity of this render, however, that has changed with the latest firmware files we have obtained. With help from XDA Junior Member franztesca, we found code within the MiuiCamera application that suggests that the Mi Mix 2S will have a front-facing camera mounted on the bottom—similar to the Mi Mix and Mi Mix 2. This fact discredits the render above, as it would indicate that the Mix 2S would have a design similar to the Mix 2 rather than the radical corner notch alleged by the render. The above is a method from the com.android.camera class within MiuiCamera.apk. This method is used by the app to check whether or not the camera’s front-facing camera sensor is mounted on the bottom, and if so, it needs to enable auto-rotation in the camera app so the camera viewfinder will be oriented correctly when it’s time to take a selfie. IS_A8, IS_D5, and IS_D5X are defined earlier in the class as “lithium,” “chiron,” and “polaris” respectively, which are the code-names for the Mi Mix, Mi Mix 2, and Mi Mix 2S respectively. Hence, this method returns true if the device is one of the Mi Mix devices—which tells us that the Mix 2S front-facing camera is indeed at the bottom of the display. Rumors have pointed to the Xiaomi Mi 7 being the first Xiaomi device to support wireless charging, but I was unable to find direct evidence for that in its firmware. I was able to find what I believe to be the Xiaomi Mi Max 3‘s firmware files which did show evidence for wireless charging, however. In the most recent firmware for the Mi Mix 2S, I have also found similar evidence within the MiuiKeyguard app for the device having wireless charging. 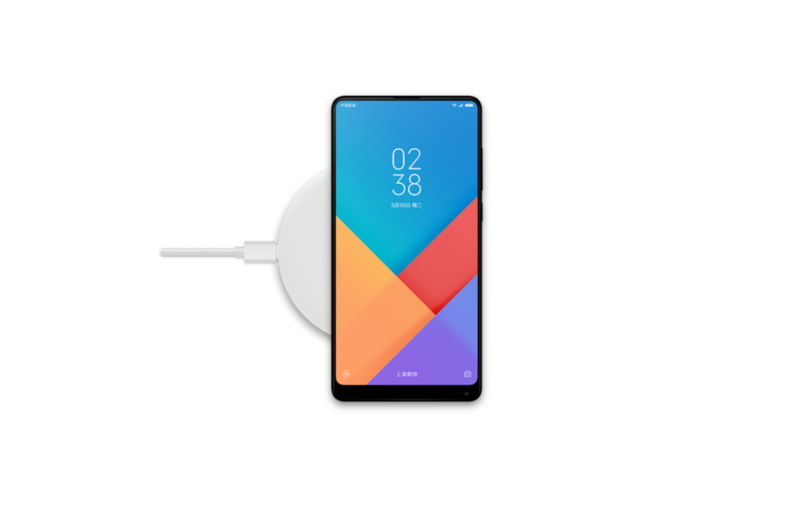 The feature image at the top of this page is a still image showing off what I initially believed to be a generic image of a Xiaomi device featuring wireless charging, but given the bottom placement of the front-facing camera, it’s possible that this design is of the Mi Mix 2S (which unsurprisingly would mean it looks very similar to the Mi Mix 2). Below, I have embedded the help video that MIUI will show to the user when they have trouble aligning the device with the Qi wireless charging pad. After a brief stint with Project Tango, Google’s ARCore is here to bring augmented reality to millions of Android devices. The company recently announced that they would be bringing ARCore 1.0 to devices such as the Galaxy S7/S7 Edge, LG V30/V30+ (on Oreo), the ASUS Zenfone AR, and the OnePlus 5. Furthermore, Google announced partnerships with many companies to ensure that upcoming smartphones would support ARCore out of the box. One of those companies is Xiaomi, and it appears that the Mi Mix 2S will support the augmented reality platform at launch. That’s all of the information we have to share at this time. If we find out more, we will keep you updated on the XDA Portal. Follow our new Exclusive tag to catch these posts as soon as they go live!